ALMOST 4,500 people have signed a petition calling for the Minister for Housing, Eoghan Murphy, to stop the St Helen’s Court eviction in Dun Laoghaire. 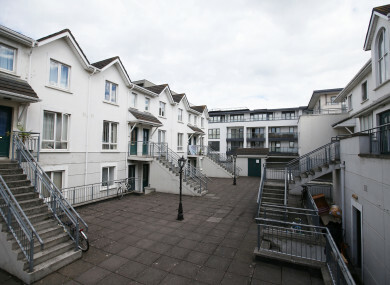 It emerged last week that 17 tenants in the south Dublin apartment block had been served with notices to vacate by two investment firms – Apollo Global Management or Deutsche Bank – which own the properties. The companies – so-called vulture funds – have told the tenants that they need to vacate the apartments so the complex can be refurbished. The tenants will have the opportunity to re-rent the apartments if they go back on the rental market. However, the tenants believe they will be charged higher rents when they move back in. Currently, landlords can only increase rents by 4% in Dublin – but this rule does not apply if significant refurbishment has been carried out. Local TD for the area Richard Boyd Barrett is advocating for the residents. He told TheJournal.ie today he has received “a perfunctory acknowledgement but no substantial response” to a letter he sent to Minister Murphy. Boyd Barrett said this is “extremely disappointing”. “A lot of people realise it could be them,” added Boyd Barrett of the support for the petition. A meeting was held on Saturday where it was decided that all of the residents are going to write to the minister to appeal for him to intervene in the situation. If the residents don’t receive a favourable response, it is understood they may consider a protest. They are also urging Minister Murphy to communicate with the Residential Tenancies Board (RTB) on the issue. They are going to appeal the situation to the RTB and want the minister to instruct the RTB that tenancy protection legislation “should not be abused”, said Boyd Barrett. They want any loopholes in such legislation to be closed down. “If there’s ambiguity in the law then the minister has an obligation to clarify what is the intent of the law,” he said. Boyd Barrett said there should be a serious investigation into whether the works on the apartment block are necessary. He said that six of the units in the complex not owned by the two investment companies have not been asked by their landlords to leave over necessary works. The residents have been trying to contact the investment companies to discuss the issue. The pending eviction has put a lot of pressure on residents, said Boyd Barrett, particularly families who have children in local schools. He said this is “obviously worrying for many of the people there”. Boyd Barrett said that the residents want the minister to step in and intervene because it “isn’t just about the 17 families and households in St Helen’s Court, but potentially huge numbers of tenants that are in the same boat”. “Excessive rent increases and evictions for spurious reasons will not be tolerated – that is the message that has to come from the minister,” said Boyd Barrett. He also suggested that the government could purchase the apartments and rent them to the tenants under an affordable rental scheme. “It would be entirely reasonable for the government to come in and offer some sort of price which would still allow these guys [the investment funds] to make a bit of money but which wouldn’t involve the eviction of tenants or increase of rents to unaffordable levels,” he said. Email “'People realise it could be them': 4,400 sign petition to stop Dun Laoghaire eviction”. Feedback on “'People realise it could be them': 4,400 sign petition to stop Dun Laoghaire eviction”.